Across Scotland today we will commemorate International Workers Memorial Day. On this day we remember the dead and fight for the living. This year is particularly important because the Con-dem coalition is adding to the risks by piling pressure on staff and enforcement agencies, cutting away at health and safety. Last year the Labour Government officially recognised this day and it is pleasing to see far more local authorities across Scotland marking the day. Workers deserve to know that they will not be at risk when they start a day’s work - they should not have to fear for their lives. Around 70 per cent of workplace accidents are due to the poor health and safety management. The Government must stop this figure spiraling - there is a better way. Just to illustrate a point I have made in earlier posts, there are consequences of increasing council charges to fund the Council Tax freeze. Today I was on the election trail in Kilmarnock. The council has recently introduced charges for special refuse uplifts. 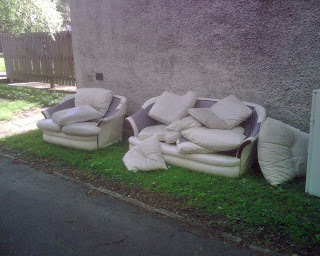 As a consequence local people report an increase in fly tipping. Walking around just one scheme in the town I came across furniture and other items just dumped. An eyesore and a safety concern. Below is a picture of just one example and a dangerous one at that. Fridges not only contain dangerous chemicals but can be a death trap for young children playing in them. The Council Tax freeze is not a free policy, it has consequences and some of them could be fatal. Interesting EAT decision (Scottish employer) on bias in appeals, an issue that comes up often in the smaller employers we deal with. In Watson v University of Strathclyde EATS/0021/10 ( no relative!) the pursuer worked as a publications officer in the University of Strathclyde. Mr Taylor was the director of marketing and Dr West was the secretary to the University who appointed Mr Taylor. In 2005, Mr Taylor was convicted of a breach of the peace and offered to resign. Dr West decided that this was not required as this was a personal matter and did not impact on his job. Before this incident, the pursuer had a history of concern about Mr Taylor's behaviour, which she considered violent and aggressive. This conviction naturally highlighted this concern. Problems with their relationship continued and she submitted a grievance alleging inappropriate behaviour and autocratic management that was rejected. She felt Dr West had a conflict of interest because of his support for Taylor. She then refused to attend an appeal panel because Dr West was a member and subsequently resigned claiming constructive dismissal. The ET concluded that Dr West's membership of the appeal panel was not a fundamental breach of contract. However, the EAT found that, for there to be a fair hearing, it must be free not only from actual bias but from apparent bias, and that this applied equally to any hearing that forms part of a grievance process. Any reasonable employer would have considered the claimant's reasonable concern that there was bias and that it would not be fair to her to include Dr West in the appeal panel. Whilst it is obvious that a person who is the subject of a grievance should not be involved in the hearing of that grievance, employers also need to consider the position of other members of staff who are very closely associated with the subject of the grievance. The EAT is not suggesting that an employer setting up a grievance appeal panel is routinely required to consider specifically whether or not there is "apparent bias" in the panel. However, any reasonable employer is required to have regard to the need to afford an employee a fair hearing of their grievance throughout, including at the appeal stage. It was key in this case that the claimant had raised an allegation of bias. An unsurprising poll in the Scotsman today indicates that 75% of Scots support the continuing Council Tax freeze. Given rising inflation, VAT increases and a wage freeze for many, it is not surprising that the public favours tax cuts. This is reinforced by the fact that only 10% support a Local Income Tax at the rate necessary to replace the Council Tax. Of course much of this polling depends on the questions you ask. I was doing a focus group with UNISON members last week and they equally, if by smaller numbers, favoured a tax cut. However, when asked the question if they favoured the charge increases most councils are implementing to plug the financial gap, the answer was no, because they identified the regressive nature of charges. Even fewer were in favour when the funding gap is identified and the consequences for further cuts in services. All of this demonstrates one of the more dismal aspects of the election campaign, namely the unwillingness to explain the scale of the financial crisis in public spending and the consequences. It is not just the budget cuts, and they are bad enough, but they come at a time when demand for services is rising. Public finances face at least four years of cuts as part of the Con-Dem deficit reduction plan. In Scotland the downward pressure on resources could last for at least 10 years with some £40 billion of expenditure lost to public services. It could take at least a further 10 years before spending returns to 2009 levels. The Tories claim to be telling it as it is, despite supporting a council Tax freeze and other tax cuts. However, even in the rhetoric not all candidates are on message. My local Tory MSP has sent me a mountain of paper in the last few months telling me that he is in favour of more teachers, police, better roads etc. He would be better off telling his colleagues Cameron and Osborne. I met Lord McFall and his colleagues on the Workplace Retirement Income Commission in Glasgow today. The Workplace Retirement Income Commission (WRIC) is the independent review of retirement saving. The Commission is seeking to find better ways to provide retirement income for the millions of working people who depend on workplace saving for security and dignity in retirement. They have produced a very good background paper on workplace retirement saving as part of their call for evidence. Not surprisingly, I emphasised the undermining of public service pensions by the UK Government and in particular the 50% increase in contributions that is likely to drive many low paid workers out of their pension schemes. But low income is not the only barrier to getting people to save. Savers need to have confidence in the long term benefit of schemes and in this regard the switch from RPI to CPI has seriously dented confidence. UK private pensions are notoriously poor value for money with Dutch schemes delivering almost twice the benefits. Confidence in the financial institutions is rightly at an all time low. A new approach is needed to simplify the pensions system with easy to understand products where the benefits are not eaten away by management fees. I cautioned against less regulation and in favour of a more prescriptive approach that starts to build retirement income at an early age. The Commission is planning to publish an interim report in June. Transport dominated the debates this morning, but the most powerful contributions were on domestic violence. Two sisters made very moving contributions based on their own tragic experiences including UNISON's Marie Garrity. A real wake up call for everyone. The living wage debate highlighted again the issue of low pay. The adoption of the living wage by the Scottish Government and some councils is welcome. But it needs a Living Wage Unit, on the London model, to drive this policy forward, particularly through public procurement. That is what Scottish Labour is rightly proposing. We had a typically polished performance from the First Minister this morning. More statesmanlike, following the parcel bomb story this morning, than his usual style. He pressed many of the right buttons for the audience although still failed to grasp our concerns over the need for a balanced energy policy. He made a good contrast with NHS privatisation in England, and he is entitled to claim credit for a good record. However, he somewhat over egged the case when he claimed no PFI. The Scottish Futures Trust is developing wide scale PFI schemes in Scotland. The Hub Initiative in NHS Scotland is a straight copy of the English LIFT PFI scheme. At lunchtime I spoke at a fringe meeting organised by the Campaign Against Climate Change. I spoke about what needs to be done to deliver on the targets in the Climate Change (S) Act. In particular on the need for a strong public duty and action on Green Workplaces. The Scottish Government failed to introduce mandatory annual reporting, weakening the duty considerably. There was a good debate on energy and manufacturing strategy issues. Pensions was the big debate of the afternoon. Led by a motion from UNISON Scotland. This is an issue that unites the movement, particularly over the proposed pension contribution increases. Delegates described this a tax on public service workers because not one penny goes into pension increases. One delegate offered to swop his pension for the one George Osborne approved for the publicly owned bank Chief Executives. The debate on care for the elderly highlighted today's FAI report on the Uddingston care home fire that resulted in 14 deaths. The report states that the deaths were preventable. Those who argue for less regulation should read this report carefully. Overall this year's STUC has put a real focus on the Better Way campaign and the alternative to the Con-Dem government's cuts. My only tricky moment, as highlighted in the Herald Diary today, was being mistaken for Bob Crow! My worst nightmare realised! Public services dominated the morning session of Congress today. Delegate after delegate highlighted the impact of the Con-Dem coalition's spending cuts on a range of public services. The planned 60,000 job losses will also have a big impact on the economy with a similar number of jobs going in the private sector. Low paid working women will be the most affected, undermining family budgets when they are most under strain. "And it's a low, mean, dishonest trick to try to implement cuts to the services of the most vulnerable people in our society. We believe that everyone should have as much independent, choice and control over their care as they want. But this has to be real choice, not the only option because other facilities and arrangements have been closed or made unavailable." The afternoon session had a Westminster feel to it. It started with Ian Davidson MP, Chair of the Scottish Affairs Committee setting out the issues his committee planned to investigate this year. He was followed later in the afternoon by the Shadow Secretary of State, Ann McKechin MP. I also attended a lunch time event with colleagues from the energy industry. Not much support for the SNP manifesto plans there. A balanced energy policy retains widespread support from those who work in the sector. One of the Scottish Affairs Committee investigations is into health and safety in Scotland. We met several of the MPs in the afternoon to highlight our concerns over the impact of cuts at the HSE. Fewer inspections, guidance and projects will inevitably undermine safety in Scotland. As will similar cuts in the other enforcement agency, environment health departments. Stress was the biggest safety risk identified by every union at the meeting. The largest cause of sickness absence and often the product of work intensification and human resource strategies. At the STUC Congress in Ayr this week. Bit of a trek from the town centre to the Ayr Racecourse, but a very attractive conference venue. Sunny weather helps! The morning session on the Better Way campaign was an excellent innovation. Good use of film clips to illustrate the campaign activity undertaken by the STUC and affiliates. But the important contributions came from some 30 community organisations who came along to support the campaign and explain how the cuts are impacting on a wide range of service users. This shows that the alternative to the Con-Dem coalition cuts is building support. Scottish Labour Leader Iain Gray addressed conference in the afternoon. He focused on workplace issues and jobs. He confirmed Scottish Labour's manifesto commitments on issues like workplace violence and workplace health. He also promised meaningful engagement with the trade unions over economic policy with a new consultative structure on this and in local government. But his real message was on jobs and in particular youth unemployment. Big commitments, but it is clearly an issue he cares deeply about. Anyone who lived through the Thatcher years should share this vision. Good debate on the economy with a focus on the fair taxation elements of the Better Way campaign. HMRC workers highlighting the £130 billion of avoided tax. This alone would wipe out the deficit. A strong and credible intervention in the election debate this morning from CoSLA on the Council Tax freeze. In particular pointing out that £70m simply doesn't cover the cost. I would add that more attention needs to be given to the impact of council charging, the method most councils are using to plug the gap in addition to cutting services. I have spoken to a number of candidates in the election who report increasing public concern over the consequences of charging. One example just this morning is fly tipping when the council charges for special uplifts, creating an eyesore and safety concerns. The bigger point in the CoSLA statement this morning is the need to focus preventative spending on better outcomes. This is a point that has come out many times in the evidence to the Christie Commission. Despite rising levels of public spending over the last decade, improved outcomes have not been experienced by all the people of Scotland. We have made little progress on mitigating inequalities in wealth and income, health, safety, learning and employment outcomes; in many cases, things have actually got worse. • The gap in healthy life expectancy between the 20% most deprived areas and the 20% least deprived areas in Scotland increased from 8 years to 13.5 years across the period. • Not only do the most deprived members of our community have shorter lives, but the percentage of their life lived with ill health has increased from 12% to 15%. • The gap between the bottom 20% and the average in learning outcomes has not narrowed. • The percentage of children leaving school directly into unemployment has risen to 22% for the bottom 20% of the young population of Scotland. • Youth unemployment has risen from 13% to 20% in the last 3 years and over 70% of that group are long term unemployed. We know from the research of the Equality Trust (The Spirit Level) and others that more equal societies do better on nearly every measure. It also makes sense in public spending terms because it is the most disadvantaged households that will place the largest burdens on public finances throughout their life time. It is easy to blame the politicians for not addressing this. However, they have to get elected and the public at large do not as yet fully understand this point. I suspect any political party writing an outcome based manifesto would have a big credibility gap. None the less they have a role with the media and civic society to make the case that this is the only way forward for Scotland. Quite late in the day we now have the SNP manifesto. As you would expect from the current government party it is largely a description of what they claim to have achieved over the past four years. There is plenty in this manifesto to support. The SNP record on aspects of health policy is sound and in particular their rejection of privatisation and no compulsory redundancies. Similarly, there is an unequivocal commitment against the privatisation of Scottish water and the trojan horse of mutualisation. Coupled with an ambitious vision for developing our greatest asset. The policy on student fees is welcome as is the promised additional funding. Some new commitments on funding early years is welcome. UNISON has been critical about aspects of the Scottish Government policy is this area that has been stronger on frameworks than action. The new focus on preventative spending and the development of family centres is welcome. Although there is still an obsession with nursery teachers and other early years professionals barely get a mention. Other aspects of the manifesto are less welcome. In justice the claimed 1000 police officers 'on the beat' is outrageously misleading. Many of these police officers are backfilling civilian staff - behind a desk, not on the beat where they should be. Five more years of the Council Tax freeze may be popular but there is no mention of the schools, day centres and other council services that will be closed to pay for this. Not to mention the increase in charges for services that are more regressive than the Council Tax. The energy policy with 100% coming from renewables has rightly been ridiculed in this morning's media. A balanced energy policy is always the right policy. Overall a bit of the proverbial curate's egg. Good in parts, but with some very silly bits. And of course we have the big distraction of separation. Nothing specific on the timing of another referendum promise - so we can expect five more years of complaining (in or out of government) rather than focusing on the key issues. Political parties contesting the Scottish Parliament elections are marking "climate day", organised by the Stop Climate Chaos Scotland (SCCS) coalition. SCCS is a coalition of around 60 organisations in Scotland (including UNISON) that are campaigning on climate change. Together SCCS represents over two million people in Scotland, an amazing 40% of the population. A range of proposals are on offer today as the parties highlight their green credentials and related proposals from their manifestos. These include a range of practical measures to help meet Scotland's radical carbon reduction targets. One of the issues UNISON is highlighting is the importance of a strong public sector duty and the promotion of Green Workplaces. Scotland has the toughest targets to reduce greenhouse gas emissions of any country in the world – and our local authorities and other public bodies have a major part to play in making a success of our ambition. Thanks to campaigning by UNISON and others in SCCS, public bodies have statutory duties under the Climate Change (Scotland) Act 2009. Yet the Scottish Government does not plan to require public bodies to report on what they are actually doing to reduce emissions – making it difficult to monitor their performance and therefore their overall progress. If you can only do one thing for climate change today then please go to the SCCS Livestream webpage from 7.30-9pm tonight for the first ever online election debate on climate change. From the comfort of your own home, you'll be able to watch a lively discussion between party spokespeople, and post your climate change questions to them live The debate will be hosted by former BBC (Reporting Scotland) journalist, Alan Mackay. BBC Scotland has published its traditional issues poll today. Given the recession and financial crisis you might have expected something of shift in priorities. However, the poll shows that traditional public service issues dominate, including the NHS, Police and education in the top three. Mind you there is some really sloppy BBC wording on the police question. The Scottish Labour manifesto at least talks about police on the beat - the SNP government have put expensive police officers behind desks to replace the sacked civilian police staffs. Not surprisingly given pay freezes and inflation, tax cutting proposals are in the top half. With the exception of business taxes that gets a big thumbs down. Perhaps the message about corporate tax dodging is getting through! The crazy Local Income Tax bombs badly near the bottom of the list. Watch out for more ducking and diving on this issue. A referendum on independence also languishes at the bottom reflecting peoples priorities in these difficult times. Interestingly, so does the national police force, possibly reflecting a preference for local services. Overall a positive expression of public support for public services in these difficult times. I was running a workshop on Scottish housing issues at our UK housing seminar in York today. In a tight financial environment there was a feeling that housing appears to have slipped down the list of political priorities. The Scottish Government has cut the housing budget by 22% this year and none of the other parties are making significant spending commitments. Not that need for housing has gone away. Nearly 200,000 households are on housing waiting lists and over 56,000 made homeless applications. Homeless applications have increased by 26% in the last ten years.The number of new houses being built in all sectors goes no where near meeting this demand. We are also making little progress in improving housing stock condition. 298,000 homes in Scotland are affected by dampness or condensation, 44% fail the energy standard and 62% of social housing falls beneath the Scottish Housing Quality Standard. The funding plans of the Scottish Government simply spread the available finance around a little thinner, although they have at least built a small number of new council houses. Small programmes like the National Housing Trust and the Innovation and Investment Fund make a good political announcement but deliver small numbers of new houses. Labour isn't promising much more in finance terms although they have an innovative loan guarantee scheme for first time buyers. The workshop looked at how we might use local authority pension funds (they are worth £20bn in Scotland) to generate housing bonds to finance new build. However, the UK government cuts in housing benefit could impact on this idea, not to mention undermining the pension scheme itself. Another day another manifesto. This time Scottish Labour. Scottish Labour prepares its manifesto very differently from other parties. It is the culmination of a two year process of consultation, not just with party activists, but with Civic Scotland and the public. And it shows throughout the manifesto. From a UNISON perspective, when other manifestos talk about teachers, Labour also talks to nursery staff, classroom assistants and others. The same applies to other services. By properly engaging with trade unions the manifesto reflects many of the concerns of the workers who deliver essential services. Each section of the manifesto starts with a real person's story. Then a vision of what Labour stands for, followed by the detailed policies. No uncosted promises that a government in the current financial climate can't meet. But lots of often small, but important changes, that could improve Scotland. Unlike 2007 this manifesto is unrelentingly positive. Its about what Scottish Labour will do, not what others haven't. I think that reflects what people want to hear about in this election. That doesn't mean I agree with everything in this manifesto. I am sceptical about the creation of national services for care, police and fire, until it can be demonstrated that there are effective mechanisms for local delegation and accountability. The Council Tax freeze and small business bonus may have been forced by political reality, but it is still wrong. All the political parties claim to be committed to preventative spending, yet these tax cuts would pay for 9000 extra early years staff. That could make a real impact on children from disadvantaged homes during those vital early years, saving literally £billions in later years. "It means we can say, with our hand on our heart. You see what the Tories are doing to the NHS in England? We won’t have that here. You see what the Tories are doing to the universities in England? We won’t have that here. You see what the Tories are doing to council services in England? We won’t have that here. This is what our parliament is for. And Labour will use it to fight for the things that really matter"
A strong and important message to go with a manifesto that is about what we can do with our own devolved Parliament. Scottish Liberal-Democrat manifesto launch today. Big emphasis on the 'Scottish' here because no one is mentioning Nick Clegg. Not a good start for the Lib-Dems with candidate defections and another retiring MSP supporting Alex Salmond for FM. Even for the Lib-Dems this is bizarre. But the real problem is their UK coalition deal with the Tories that is heaping so much pain onto Scotland. This is a difficult manifesto to comment sensibly on as there is no discernable theme. Just a mix of random policies that appears to have been written by a large committee. Not a lot to dislike, but not much to excite either. Bit like the Lib-Dems really until Clegzilla sold them out. The headline is the privatisation of Scottish Water. Whilst the Tories clearly understand that they are privatising our water, I am still not convinced that the Lib-Dems really understand how the industry is financed. As a consequence their proposal is just illiterate. £1.5bn for an industry that has assets worth around £20bn! Much about local delivery which is fine, including local policing. But then the actual proposals let them down. 'Payment by results' doesn't sound much like local democracy. Who pays and who judges the results? The rest of this section is another eclectic mix of policies that simple don't gel together. Scottish Enterprise and Skills Development Scotland to go and be replaced by ill defined regional development banks. These will help businesses apparently, but no mention of the big jobs undertaken by SDS, such as careers advice. Of course it was a Lib-Dem minister in the last administration who created SDS when he should have transferred the careers service to local government. Now that would be real localism. I could go on, and the manifesto does - for another 85 pages. The problem is still there at the end. They still have Nick Clegg. Today we had the launch of the Scottish Conservative manifesto. Not a good start from the Tories with candidates dropping out at a rate of knots and a UK Tory government sending Scotland back to the dark days of Thatcher. The manifesto doesn't exactly inspire confidence. We are told this is the realistic manifesto, we are not deficit deniers. Yet the manifesto proudly triumphs four years of a Council Tax freeze, that increases the financial burden on councils and new tax cuts, for business of course. A strange way to cut the deficit. We are told the deficit was caused by the failure of Labour's regulation. Yet the Tories constantly called for less regulation and they do so again in this manifesto! And no Annabel, you haven't put 1000 extra police officers on the beat. They are sitting behind desks doing the jobs of sacked civilian staff. Then we are offered the privatisation of Scottish Water. Sorry, we are not fooled by the old 'public interest company' trick. A move that will hand over Scotland's greatest asset to overseas water multinationals at a fraction of its real value. Then the water charge payer picks up the tab through increased water charges. More PFI to build infrastructure. Haven't we paid enough billions more than required without going back to that failed Tory policy. There is no such thing as a free lunch, unless of course you are a big business lobbyist. The 'right to bid' for public services is offered for the voluntary sector. But the business lobby knows full well that if public services are put out for competition, they are allowed in to bid under EU procurement rules. So again the voluntary sector is being used as cover for the wholesale privatisation of Scotland's public services, including the NHS and Schools. For what is left of our public services after wholesale privatisation we have a hotch potch of proposals. Community justice is to be moved to the prison service, apparently to aid rehabilitation but without any explanation of how this would improve matters. Oh, and we will be able to elect our local sheriff. Let's just become the 51st state of the USA and be done with it! Over 100,000 social houses have been lost in Scotland due to the 'right to buy'. So the Tory solution to the housing crisis - of course, let's reintroduce the 'right to buy'. That will be a real incentive for councils and housing associations to build more houses for the 200,000 Scots on waiting lists! Tucked away near the end is a proposal to reduce meat inspection. Just what we need, a nice bit of Salmonella. What was that about failed regulation? Sadly this manifesto is what you would expect. The failed polices of the 1980's revisited on Scotland - albeit dressed up in language that fools no one. Doing a lot on pensions last week and this with a number of presentations about our pensions campaign. A lot of anger from members outraged about the undermining of their occupational pension scheme. Today we have the UK Government announcing plans for a simpler state pension of about £140 a week in today’s money in what Steve Webb, the UK pensions minister, described as “the biggest shake-up of the state pension system for generations”. The single pension would be set just above the means-tested pension credit of £137.35, allegedly making it clear that it pays to save for old age. “We have to send out a clear message that you will be better off in retirement if you save,” Mr Webb said. Well that's not how it looks if you are currently paying into a public service pension scheme. They no longer trust the Government on pensions after unilaterally switching the indexing of benefits from the RPI to the CPI - a move that will cut average benefits by at least 15%. You pay into a scheme all your life and then get the benefits cut. That's just robbery and fatally undermines confidence in saving. But the biggest impact on pensions and saving will come from the proposed 3.2% increase in contributions. For low paid workers in particular this is simply unaffordable when you are facing a pay freeze and attacks on other terms and conditions. We already have a growing number of staff opting out of pension provision and this will rapidly increase if this plan is implemented. So not for the first time it would appear that the left hand of government doesn't know what the right hand is doing. Or if you like a good conspiracy - maybe they do!